About the size of a postage stamp, every nook and cranny is filled to the brim; Paris Vogue, Numero, Dutch, vintage designer look books– it seems like every uber-cool publication can be found among the rare fashion and photography books here. I can’t imagine any other place I would want to spend a rainy afternoon in Paris. However, I wouldn’t bring a friend, it’s so small they may not be able to fit both of you! would LOVE to go there and look through all those magazines! Great photo. As always. I love vintage style, and that’s it, you got me. can you find the book, “The Sartorialist” there? Wow! This is truly a hidden gem! It is about / or feels like 100ºF in Buenos Aires .. so aside from longing to be in Paris, no matter what … I would so love to be there today . Cool, damp and a quiet book store would make me so happy .. I can see why. Beautiful photograph, Scott, looks like a place many of your followers (myself included) would be very happy to spend an afternoon. Oh, Thank you a lot !! It is so useful to know where to find a place like this in Paris. I’m an Accessoire-Design student from Germany. Looks lovely! I love finds such as these! Quality bookstores are one of my fave things to search for in new cities! Thank you for sharing this with us!! the black and white picture makes the place even more interesting! Nice picture. Looks like a place were you can hang out for hours. Thanks for the tip. A bike and a good visual arts bookshop in black-and-white. Atget, Brassai, et tu. Sure would like your take on the Men’s collections – very interesting stuff – esp. Thom Browne. “Ciné Reflet”, in the 6th district, is really nice for those who like cinema! YOu say favorite *shop*….. better than all the clothing shops in Paris?!?!? Thanks for the info – Definitely a shop that we should visit. A cacophony of books in a vintage ambiance…. I wish Iv had known about this place when I was in Paris!! I hope to have the opportunity to visit it next time. Love it! !Regards from Buenos Aires,Argentina. I have never been to Paris, but if I close my eyes, I can picture the rest of the bicycle, and the book store attendant. When I was an au pair in Paris in 1998 i used to go there all of the time!!! I remember the shopkeeper. I am so glad Comptoir de L’image is getting a mention. If you are in Paris, you have to stop there. It is in the Marais. This shop is a DREAM for magazine and fashion book collectors. Oh my gosh! That’s like heaven for a nerd like me! Gosh, Paris is such a dream for me. This little bookshop is great it has that Parisian feeling I love. If you get a chance do check out my blog, I have interesting fashion posts you might love to read. OOhhhhh. Thanks! Marking it down on my Paris To-Do List! What a lovely memory this evoked, as I recall walking by this charming shop, in a rush to meet someone, and wishing I had a moment (or hour) to pop in. Alas, I had only a limited number of days to spend in the city and many obligations while there. It’s one of the many reasons I hope to return one day to Paris, so that I can explore the nooks and crannies at a much more leisurely pace. Seems like a truly mouthwatering locale for any bibliophile..! We need more stores like this in the U.S.
love it. will definitely try and visit when i’m in paris! What a coincidence. I will be in Paris at the end of next month and I will be there alone. And as I love books and old magazines I definitely will go there and have a look. Great, that you posted this one now. Just wrote down the address. Any other shops of this kind you could recommend? This photo brought back some really good memories; time spent rummaging amongst the wonders on those shelves and floor followed by several coffees reading my new wonders. I spend many happy hours in places like this, and many Euro. In reply to comme fraiche, of course you could get The Sartorialist book there; probably. To be honest though I’ve very rarely seen it in second hand book shops(twice in the last two years locally). It’s a book people keep and read. Yesterday I also posted a picture of this little store in Paris ! At the time I took the picture, the store was closed :( But it looked indeed like a true paradise for booklovers ! By the way: love your blog ! “my one and only hidden treasure in Paris” – Can that really be true? 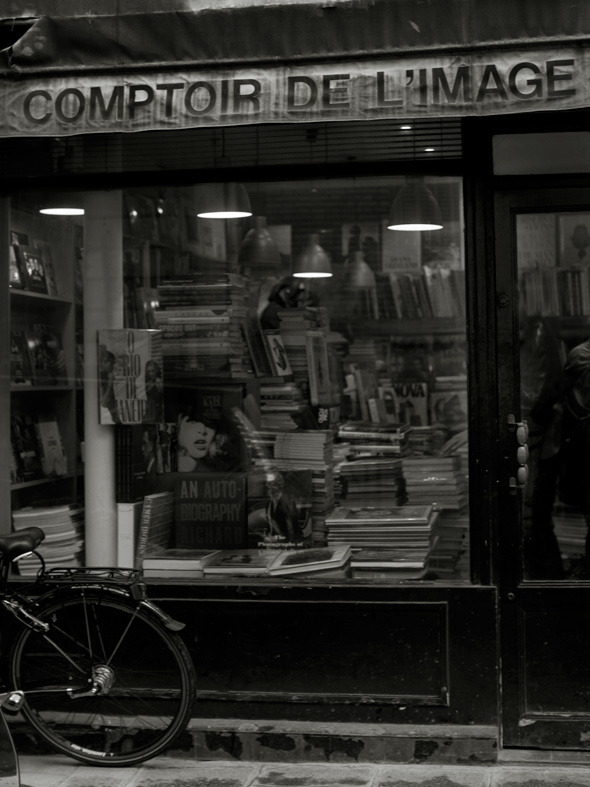 A great place but when talking books in Paris, you have to include Shakespeare & Company. It is not a direct comparison but for a book lover in Paris, it is impossible to go there and not leave without buying something. This looks like a place I want to be! We used to have a store just like this in Manhattan called the Gotham Book Mart. Sadly, no more. Treasures such as this need to multiply and be sprinkled around the world. just fabulous, in the absolutely dusty and perfect Parisian sort of way. I love old stores like this, with creaky floors and proprietors who have been there forever and know every nook and cranny. I’ll bet you can’t stop at just one when you buy something from there, though. Love it!! Thanks for sharing your hideaway – can’t wait to check it out when I visit! one great place to spend time…esp when it is raining! Oh wow it looks fantastic. I’ll definitely check it out next time I’m in Paris. wonderful! any books in english? I went here 5 years ago to be exact and I fell in love! I could not remember the name of this place. thank you so much for posting it! amazing place! Your black and white photos are lovely. Looks like a great place! Looks like a great place next time I’m in Paris. Mi favorito Shakespeare and Company! 37, Rue de la Bûcherie, 75005 — en Paris. AHH! Buenos Aires-Paris! The owner of this fantastic bookshop has worked with Avedon as assistant …it’s a dream place for people who love fashion photography !! How cool!!! There’s a book cover (i guess) named “O Rio de Janeiro” on the left side of the showcase!!! Brazil’s everywhere!! I am so delighted to see this shop featured on this blog! I wandered into it when I was in Paris and considered myself lucky to have happened upon such a gem. I often wish that I could go back there. There is so much inspiration lining those walls! i, too, adore this store and visit it each time i’m in paris. and i love the owner. Does anyone know the opening times, I planning to visit. If not I’ll just have to take a guess! The Sartorialist on Paris Vogue.com !!! !